Tokyo Dome City is an amusement area around Tokyo Dome. 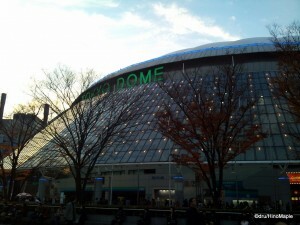 Tokyo Dome itself was opened in 1988 and was a modern replacement to the previous open air stadium. It is only in one corner of the actual site itself but it is the focal point for all events within the area. Tokyo Dome is a 55,000 seat stadium that is home to the Yomiuri Giants. They are the perennial favourites in the Japan Series of baseball. They are akin to the NY Yankees or the Toronto Maple Leafs. They are the team everyone loves to hate if they aren’t a fan of the team themselves. They have a huge budget meaning they can have all of the top players on their team alone. They have won several championships and they are almost always favourites to win the championship. The dome itself is not exclusive to baseball. They hold various concerts as well as other sporting events. When there is a game or a concert, you can expect the entire Dome City to be busy as people will arrive a little early to relax and enjoy the facilities. If you are going to enjoy a concert, you had better arrive really early if you want to buy some of the concert souvenirs. They tend to open up an outdoor area for people to enter and do their shopping. It’s a great way to make money as people will line up from the early morning and people who don’t have tickets will also enter to do their shopping. This is very popular for Japanese singers as the fans tend to be a little overly crazed about buying related items. 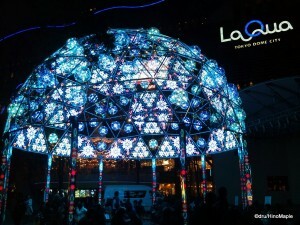 LaQua is situated next to Tokyo Dome on the north side and it’s the second major attraction of the area. It is a large shopping and entertainment complex that is famous for couples. Inside the complex they have a multi story shopping mall where you can find all of the typical Japanese fashion brands. The prices within each shop aren’t too expensive but they aren’t cheap either. 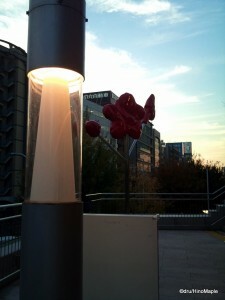 I’d probably recommend the main plaza that can’t be missed if you are heading in from Tokyo Dome itself. It’s a big open area with two floors of mainly restaurants. There are various shops to eat in, ranging from cheap fast food to expensive luxury. It’s a great range of food, but if you are looking for something Japanese, you might have a little difficulty finding it. It’s definitely worth a look and trying Japan’s take on western food. It’s not quite right, but it’s not bad either. The main attraction for most western people has to be the amusement section. There are 3 rides inside LaQua itself. The first is the ferris wheel. It’s nothing more than your typical ferris wheel but the views of the park must be nice. The other popular attraction is the log ride, Wonder Drop, which is especially popular in the summer. Located within the plaza itself, you can take a 2 story slide into a pool of water while inside a boat. It’s your typical double slide water ride, but being inside the mall is interesting in itself. The main attraction has to be the rollercoaster, Thunder Dolphin. Thunder Dolphin itself winds its way around the entire building going through a small hole in a wall located at the corner of the main building. Many people say it’s scary due to the roughness of the ride itself and the sharp corners. I have seen many friends go on it and the reactions range from frightening to just jarring. If you go east of Tokyo Dome, you will come to a relatively open area. This is mainly an amusement area. There are a few baseball themed restaurants but the major attraction has to be the theme park rides. There are several “areas” for the theme park. The first is Tower Land. There are various rides that focus on heights and dropping from those heights. The main focus is the Tower Hacker which is an 80 metre tall tower where you fall from the sky. There is a children’s version as well. Splash Garden is a summer time area that focuses on children. For the teens and adults, this will be somewhat boring, but the light and easy rides make it a great adventure for kids of all ages. Parachute Land is a small area with only two rides. The easiest to see is the Skyflower where you ascend to have nice views of the area before gently floating back to the ground. Personally it looks boring to me. Geopolis is the last area with only two attractions as well. This is an indoor themed area where you play interactive games. Unfortunately, I haven’t had a chance to actually enjoy this area as I have been too busy to take a good look around, but it is fun walk around the area. The southern area has a high mix of buildings. In the south west corner, you have the JRA building where you can enjoy the horse races and bet on who you think will win. There is no actual racing done at Tokyo Dome, but races are televised live and it’s not uncommon to see dozens of old men lining up to buy betting tickets and reading the various odds on each horse. Within that same area are a few large buildings that are multi-purpose amusement centres. They offer entertainment such as bowling and other various sporting activities that can be accomplished indoors. Golfing and a batting cage are available, but I personally don’t see a huge point in doing that. This is a fairly typical “family amusement” area. In the central south area is the Tokyo Dome Hotel. This is just a standard hotel with various restaurants and bars inside. In reality, unless you are staying there yourself, there isn’t much to see inside. 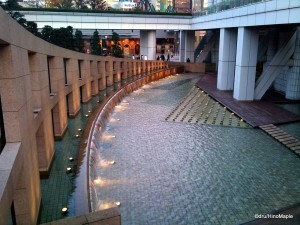 I recommend a short walk around the outside as there is a fountain on the north side that is very picturesque. On the south east corner is a small building called Meets Port. This is where you will find the most reasonable food and drinks in the entire area. If you are headed to a game or going to enjoy a concert, stopping by for something to eat and drink isn’t a bad idea. However, I’d probably stick to the JR Suidobashi Station to get cheap eats. 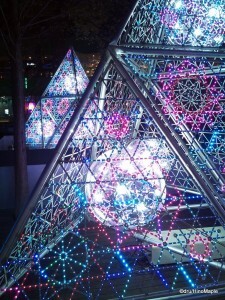 Tokyo Dome City is not a one time affair. You can visit during the various seasons and get a different experience each time. I can only account for the summer and winter seasons as I have never been there during the autumn and spring seasons. In the summer, the area isn’t that different but they do have a nice beer garden located outside Tokyo Dome. It’s one of the few places where you can enjoy a nice cold beer outside. When there are games going on inside the Dome, you can usually get a nice seat for several people and just relax. Once the game ends, you can watch everyone file out of the dome. The winter time is another good time. The entire area is decorated with Christmas lights. There are a few shows as well, but depending on the year, you might be surprised with fireworks. Unfortunately, I only know that they had fireworks in 2009, but in 2010 they decided not to do it again. Being a “theme park” inside Tokyo, they do their best to change with the seasons. For those who are looking to save a little money, I highly recommend going to the JR Suidobashi Station. 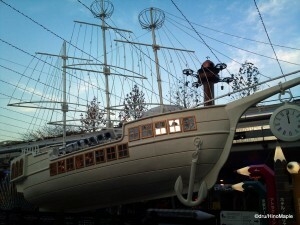 This is located across the river from Tokyo Dome City and has a lot of cheap eats. It’s more famous for its Chinese restaurants along with other small shops. It can look a little intimidating to enter a small shop with only a few people inside, but some of them are delicious. It could be difficult to choose but just do your best. This entry was posted in Tokyo and tagged Christmas Lights, Dome City, Dome Hotel, Geopolis, japan, Japan Series, JR, JRA, Korakuen, Korakuen Station, La Qua, LaQua, Parachute Land, Skyflower, Splash Garden, Suidobashi Station, Thunder Dolphin, tokyo, Tokyo Dome, Tokyo Dome City, Tokyo Dome Hotel, Tower Hacker, Tower Land, Wonder Drop, Yomiuri Giants by Dru. Bookmark the permalink.